Complex spinal deformities in the pediatric population present some of the most challenging yet potentially rewarding results in the specialized field of spinal surgery. The Fox PSDS enrolls young patients with significant curvatures of the spinal column. 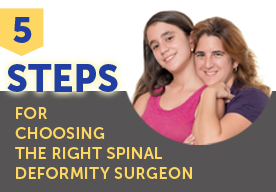 Surgeons who are leaders in the field of pediatric spinal deformity surgery are enrolling their patients in this nationwide study in an effort to improve the surgical care and long-term outcomes of these individuals. Enrollment now exceeds 120 patients. Donations from patients allow us to conduct the much needed research which strives to improve the care and long-term outcomes of people with severe spinal deformities. Continued research is made possible by the generous and thoughtful gifts from patients, families, and friends – no matter how large or small, every donation makes an impact.